To get the best from our small boats we like to keep them shipshape. 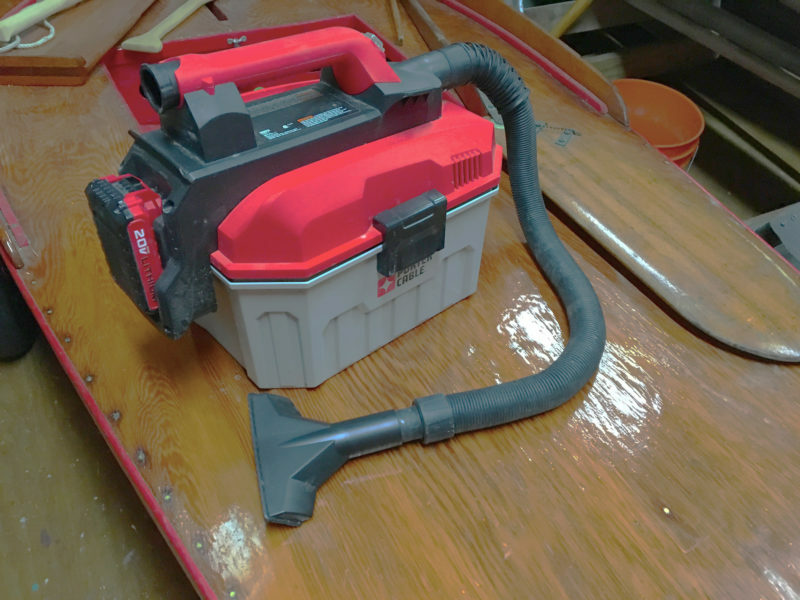 We often beach launch and have sand and water to clean up after returning to shore, so to make the chore easier we bought a Porter Cable Cordless 20V Max 2-Gallon Wet/Dry Vac. It does a great job, and we have been pleasantly surprised with many other jobs that it takes care of in our shop and home. The vacuum weighs just 7-1/4 lbs (without battery) and is very portable. The 7′8″ hose is sturdy and flexible, and wraps neatly around the power head when not in use. A crevice tool stores in the power head and a wide-nozzle tool stores on the side of the tank. The battery clips into the end of the power head. The vacuum carries a crevice nozzle in the handle and a battery on one end of the case. When not in use, the wide nozzle here clips into a recess in the other end and the hose snaps into hollows around the whole case. One of our favorite uses for the Vac is cleaning up sanding dust left over from fairing a hull. It can also collect dust when its hose is attached to our random-orbit sander. With the hose switched to the exhaust port, we use the Vac as a blower to get debris out of bilges or to test the Sunfish sailboats that we restore for air leaks. You can quickly convert the Vac from dry mode to wet by unlocking the two latches on the power head, removing the large, washable air filter, and replacing the head. The 34-cubic-feet-per-minute suction makes quick work of the bilgewater in our Penobscot 14; it will fill the tank in a couple of minutes. The vacuum is quieter than a regular shop vac, and its small size makes it easy to store and to move between our different saws. There is no bag to dump, so it’s quick to empty. The 1-1/4″ hose will fit common vacuum accessories; a soft brush head is a good addition to the provided attachments. The 20V lithium-ion battery and charger have to be purchased separately. We bought two 1.5-Ah batteries; they have about 20 minutes of run time and take 40 minutes to charge. The charger has LED lights to indicate charge status and overload protection so batteries can stay in the charger indefinitely. Larger 2-Ah and 4-Ah batteries with longer run times are available, and they all work with other Porter Cable 20V tools. The battery power is our favorite feature—no electrical cords around wet boats! We liked the Vac so much in the shop that we bought a second one for the house to do small jobs such as cleaning stairs and dewatering air-conditioner drains. Kent and Audrey have a small fleet of boats, canoes, and kayaks to maintain after spending time on their home waters in Florida. They log their adventures on their blog Small Boat Restoration. The Max 2-Gallon Wet/Dry Vac is available from various retailers. Prices vary widely, from $49.99 to about $79.99. Batteries and charger, which power a number of Porter Cable cordless tools, must be purchased separately. Hadn’t occurred to me that this product existed. Sure would be handy. With some research it seems that every one of the 20-volt tool manufacturers has one in their product line. So since I have DeWalt I’ll see what theirs is like. Point is that batteries are a major cost and it makes sense to stick with a system.